Internal tables have not yet been covered in depth, but, put simply; an internal table is a table of records which is stored in memory while the program is running. 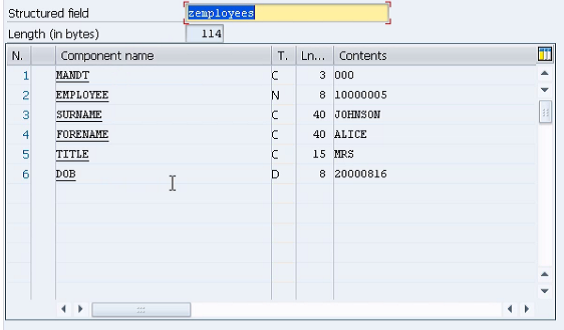 Table mode al-lows one to interrogate the records and fields of each record in an internal table. Things do look slightly different to normal here, as a table structure is being shown, rather than an actual internal table. This results in the debugger showing the table structure as above, listing the individual fields numbered 1 – 6 and their contents. When viewing an internal table in this mode, one will see a number of records for each internal table with their contents. These records can then be double-clicked to move to the above layout, showing the individual fields for each record. This will be returned to later.